SHAME ON YOU TITO SOTTO! Last Monday, Senator Vicente “Tito Sotto, III gave his emotional rebuttal on Reproductive Health Bill or RH Bill using his personal experience when his third child died from heart complications due to contraceptive usage by his wife. Most people initially never knows that his speech was a carbon copy of a blog entry by “Sarah, the healthy home economist,” a US-based writer who also opposes vaccines for children and offers recipes for goodies like grain-free pumpkin cookies. The connection to “Sarah, the healthy home economist” was first exposed by Alfredo Melgar of Filipino Freethinkers. “I always say a blanket disclosure these are not from me, ano plagiarism dun?”. 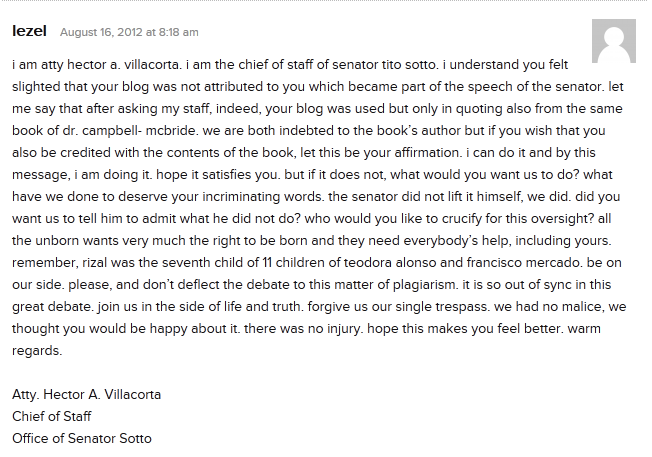 Sotto said that he and the blogger quoted from the book of Dr. Natasha Campbell McBride, whom he cited in his speech. 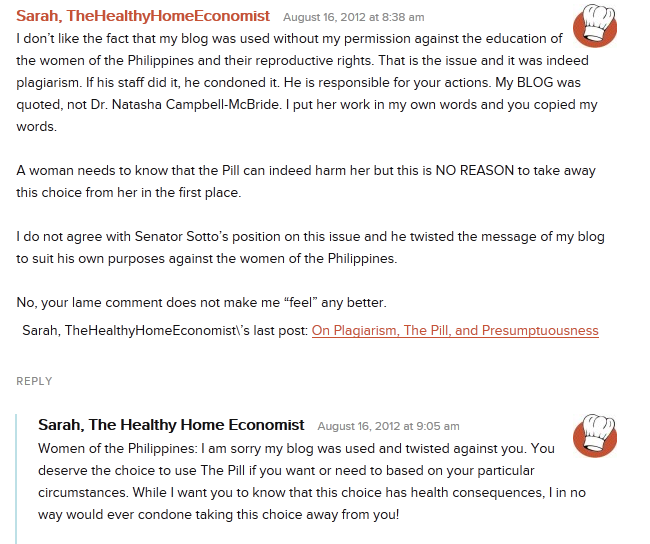 On the same day after this plagiarism issue came out within the online community, “Sarah, the healthy home economist”, the blogger who published Dr. Natasha Campbell-McBride MD’s works condemned what Tito Sotto and his staff have done of using her blog entry without permission and in fact, “Sarah, the healthy home economist” states that even her words were twisted by Tito Sotto’s speech. Tito Sotto and your staff, you should have attributed the name of the blogger first before you delivered your emotional rebuttal on RH Bill but what you and your staff have done was not just an intellectual dishonesty but a moral sin in the face of the society and your church where you and your staff belong. People are not buying your personal experience as they want a more access to artificial family planning like condom and many others without moral impediments from the hierarchy of the Catholic Church in the Philippines. For sure, Tito Sotto, your grandfather would roll in his grave on what you did last Monday and choke you to death as your grandfather became a great poet and journalist of my mother language, Cebuano, not through copying other people’s works but creating through his own ideas. DISCLAIMER: Some of the information I stated here are derived from GMA News Online. This entry was posted in Uncategorized and tagged Alfredo Melgar, Catholic Church, CBCP, Condom, Dr. Natasha Campbell McBride, Filipino Freethinkers, oral contraceptives, Pill, plagiarism, Reproductive Health Bill, RH Bill, Sarah, Shame on you Tito Sotto, the healthy home economist, Tito Sotto, Tito Sotto plagiarist, Vicente Sotto III, Vicente Sotto Sr. Bookmark the permalink. Let this be a lesson to all of you politicians who read this: NEVER depend on your staff too much when it comes to writing speeches. If you want to declaim in public, then speak it from the heart, read your own work, and not the work of others. Isn’t Manny Pañgilinan’s horrible experience a few yeas ago enough? Unfortunately, most politicians or even well-known persons outside politics are afraid to be ridiculed by most of the audience that if they can’t state their position, they will be called as “dumb” or “unintelligent”. If all politicians were to write their own speeches, or worse deliver impromptu, then I wonder how ridiculous most speeches would be. 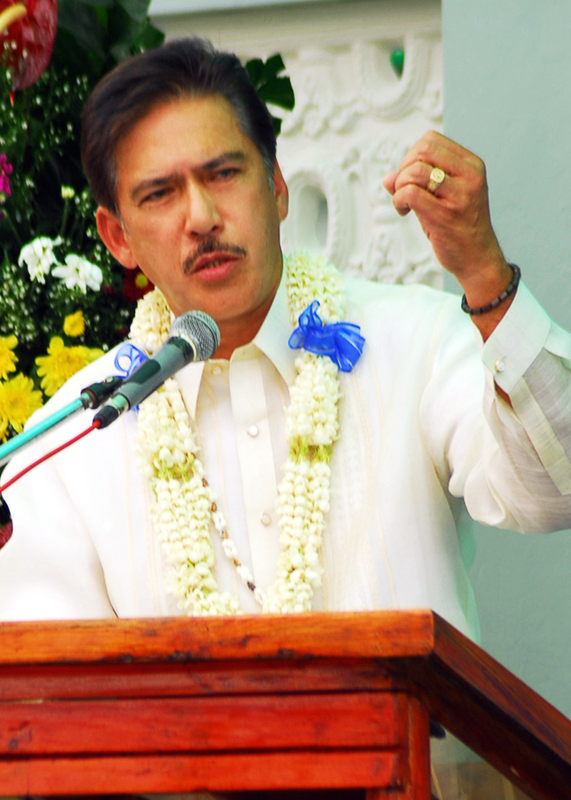 I even doubt whether Tito Sotto can do stand up comedy impromptu. You hit the nail, Jerry. Thief is a thief and always will be and plagiarism is an academic term for robbery of any formal works of an individual at all forms that should not be tolerated. Tito Sotto’s case was that he never attributed his words to Dr. Natasha Campbell McBride, the original author of his words he gave during his privilege speech. You have NO IDEA how serious plagiarism is don’t you? Well you don’t because universities in the Philippines never taught how bad plagiarism is as can be seen by your showbiz senator. i see what you did here ernesto t gacrama. riding the wave of emotional outburst of people so that you can spam us. people, do not click his link, or better yet, remove his comment. this fellow is an opportunist! Discredit where discredit is due. One has got nothing to do with the other. If he was proRH ans still committed plagiarism, he will still be cited for committing plagiarism. Ignorance is bliss. To bad people like you are probably born with it. Shut you mouth up and open your mind! Listen to what you’re saying. PLAGIARISM IS A CRIME. Stupidity and Ignorance is more dangerous than a bill that seeks to uplift the living standards. What makes this incident even worse is the nonchalant way Sotto et. al dismissed the increasing impact, content and reach of bloggers (kasi blogger lang). He should first get off his high horse then own up and apologize. SOTTORIZE v- To plagiarize, then deny, then deflect, then delegate the blame. you guys….. choose which is good for your beloved countrymen…. Plagiarism or Poison RH BILL…. Are you really that daft and ignorant? Huwag makitid ang pag-iisip. Plagiarism is NEVER good no matter how good the intent. The RH bill allows one to use the power of choice, instead of being dictated. The RH bill is a program for a BETTER QUALITY of life! Don’t tell me you’re too ignorant that you don’t use condoms because it’s against life? And yes, the church IS ignorant. It has been then, it is now. The church actually punished and persecuted people for saying that the Earth is not the center of the universe and it actually revolves around the Sun, and that man actually evolved from apes.